Having already established an effective template for deconstructing and analyzing the complexities that comprise a functioning institution, documentarian Frederick Wiseman hones his craft primarily by digging deeper into the subject and making shrewder decisions about the juxtaposition of filmed observations to comprise a narrative. 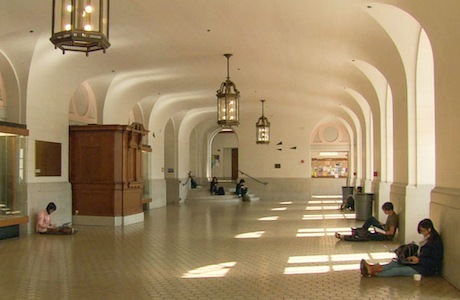 At over four hours, At Berkeley takes its time to consider the various perspectives, ideas and bureaucratic necessities that go into maintaining the core mission statement of the University of Southern California, Berkeley, starting with surface observations about their quest to imbue students with discernment and critical thinking before dissecting just how this ideal is maintained. Wiseman sits in on several class discussions, watching grad students' debate about philosophy, literature, teaching styles and the evolution of culture, often stepping back towards the impact that the poverty line encroaching on the middle class has on the heteronormative, primarily Caucasian identity. While the students discuss global concepts, becoming aware of how their motivations are shaped by the various socio-cultural signifiers shaping their education and career trajectory, At Berkeley steps back to assess how the administrative office keeps everything functioning. Though discussions about the development of processes as a method of evading the emotional component of human interrelations arise amidst the administration, economy and finance continue to pervade their thinking. Noting that government funding continues to dwindle, the evolution of the university from a learning institution to a research institution—a particularly fascinating segment observes the development of robotic legs for the paraplegic—as a mode of survival leads us into emotional debates about the cost of education. Cleverly, these student protests—primarily from the affluent trying to shape their own moral and political identity—are juxtaposed with contrary facts, showing a vast disconnect between student perception and the behind the scenes reality of how the budget is determined. Their liberal education has given them enough historical context to have a convincing vocabulary when formulating idealized social structures (free education, for one), but their limited experience—existing only within the lexicon of theory—leaves many arguments contradicting the hard proof preceding. This disconnect between student and bureaucrat bleeds into the many other areas of Berkeley, showing an institutional hierarchy where universal solipsism needs to be tempered by those with an understanding of basic economic flow. Professors seeking tenure or exploiting offers from other institutions to obtain more money understand their own needs, but don't necessarily appreciate the balance between budgetary and ideological needs that goes into deciding who is qualified for security. Similarly, department heads see only their needs for additional funds for resources and research, unappreciative for the needs of other departments and other areas of the hierarchy. Wiseman, who never interjects or forces a perspective, merely absorbs the many arguments and perspectives flying around, putting them together in a thematically logical order to give us an idea of how Berkeley operates. It's an invigorating and perpetually thought-provoking piece that has a more active, tangible political dialogue than some of his earlier documentaries, making it slightly more accessible and clear for a broader audience. Interestingly, this isn't because Wiseman has changed anything about his style or structure; it's simply because the subject—a university—has verbal argument and an active dialogue built in. Artistic organizations, like a ballet or high end strip shows, are more visual, leaving the audience to draw their own conclusions about the peculiar relationships between art and commerce.